Paybyweb - Accepting Credit Cards, Merchant Accounts & More! : Where Have All The Legitmate Companies Gone? Where Have All The Legitmate Companies Gone? PayByWeb is one of the very few merchant account providers to offer a total online experience. For example, when you apply, there is nothing to print, fax, sign, or mail. Our entire application process for Internet, mail order, and phone order merchant accounts is online. This makes the application process fast and simple. Unfortunately, it brings out every schemer in existence to see if they can get setup. While PayByWeb provides a list of unacceptable merchant types, nothing seems to dissuade those selling medical marijuana, credit repair, loan modification, travel, gaming, tobacco, firearms, and adult related services, from applying...knowing that they will be declined. Will they get approved? Not a chance! But, what it does do is cost a fortune. When using PPC to market our services, it seems like that more than 80% of those applying for a merchant account to accept credit cards via the Internet are unacceptable merchants. Huge expense...NO income! Not to mention the resources involved in the underwriting process. Merchant Service Providers spend a tremendous amount of their resources to review each application to determine the associated risk. Is this issue specific to PayByWeb? From what we are told, No. From other ISO/Agents in the merchant account industry, we hear the same thing. Tons of unqualified merchants applying. Merchants from outside the U.S. filling out applications knowing they will be declined. Even more, merchants who are TMF'd (on the terminated merchant file - Match File) and are for the most part BLACK-BALLED, still apply. What are they thinking? No...you're not suddenly going to be approved. In some cases, fraudulent merchants get an account approved and begin processing. However, in most cases, these accounts are quickly flagged, closed, and those merchants never receive any funds. It does cost more money for ISO/Agents who take the time to board these merchants only to have the accounts immediately closed. We need more of the hard-working legitimate merchants applying to accept credit cards. So...come out, come out...wherever you are! 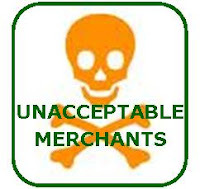 If the customers are charged and you don't pay the "unacceptable" merchants any money, where is the money going? Merchants who are on the acceptable merchant list are generally declined from having an account. In cases where they are approved and begin processing, or in cases where merchants misrepresent their offerings in hopes of processing and the merchant service provider becomes aware, the accounts are closed and the card-holders are usually refunded.